The U.S. Geological Survey says a 7.9 magnitude undersea quake has hit the waters off the shore of the eastern Philippines particularly in Sulangan Easter Samar , 8:50 PM, August 31. Tsunami Warning issue circulated over the web and craetes Twitter trend. 7.9 earthquake triggers tsunami warning to different areas at Pacific Ocean including Philippines! Let us all pray. And stay alert as well. There are no immediate reports of damage or injuries, but a tsunami alert is in effect in several coastal areas in the region late Friday. The Pacific Tsunami Warning Center has issued tsunami warning for the surrounding areas including Indonsesia, Belau, Yap, Taiwan, Japan, Guam, N. Marianas, and Papua New Guinea. 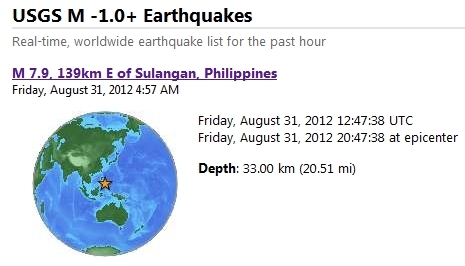 The quake was centered 58 miles east of the town of Sulangan and had a depth of 20 miles, the US Geological survey said. The tsunami warning has already been lifted for Japan and Taiwan and several other Pacific state and islands, though it remains in effect for Indonesia and the Phillipines. The head of the Philippine seismology agency, Renato Solidum, said his bureau had initially recorded a magnitude of 7.7. He said that residents living along the coastline of eastern Samar Island, which was some 66 miles from teh quake's epicenter, had been advised to evacuate to high ground in case of the tsunami.